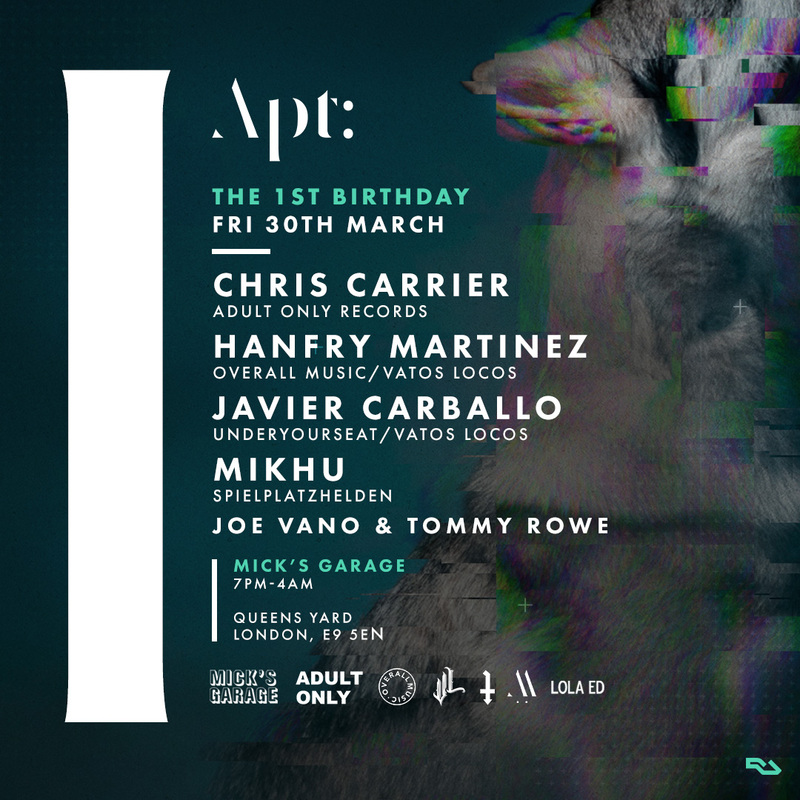 It's been an incredible first year for the Apt: collective, we've seen the brand grow from roots at Basing House to the rooftops of Dalston, open Warehouses in #Hackney to intimate Live Stream showcases in Islington.The collective move into their 2nd year on Friday 30th March in their new home; Mick's Garage, Hackney Wick. With it's raw stripped back warehouse appeal, Apt: will be showcasing their signature sound to new faces and old. After our widely renowned Apt: 010 we’ve picked out another Parisian House legend that is Chris Carrier following jef k’s amazing performance back in November. Support comes from Hanfry Martinez who joined the Lola ED agency in 2014, the French crew had had their eyes on DJ/producer Hanfry Martinez for some time. Hailing from sunny Tenerife, he started off his career in the underground electronic world as a resident DJ and promoter, before catching the ears of influential clubs around Europe and being invited to take charge of the decks at the likes of fabric London, Goa Madrid and Chalet Berlin. With a combination of sophistication and accessibility, his sets are expressive journeys that create lasting emotional experiences for the listener. Thus, he has been seen gracing the booths at some of the best clubs and festivals around the world like Sunwaves(Romania), Infuse(London), Fabric (London), Cocoon (Frankfurt), Special Case (St. Petersburg), Watergate (Berlin), BPM (Mexico) with many more to come, he now join's the Apt: stage! In true Apt: style we'll be expecting a whole host of exciting additions. Early bird tickets are on sale now at Resident Advisor and through the website aptlondon.com Stay tuned for their second Artist announcement coming soon.